North of Castries lies the small, rather unremarkable fishing village of Gros Islet, a collection of dilapidated wooden homes lining narrow streets and a rather grubby beach. But come Friday night this unprepossessing town is the place to be for everyone on St Lucia, local or visitor. The renowned Friday night 'jump-up' starts at around 10pm when the streets are blocked off, scores of vendors arrive with delicious snacks and cold beers, bars open their doors and speakers are set up on street corners. The party goes on most of the night. 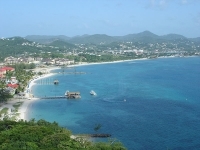 Gros Islet also offers daytime activities for families. Children as young as two years old can enjoy riding at the International Riding Stables with trained guides, while older children can enjoy riding ahead, depending on their level of experience. Children will also love the riding tour with a beach picnic at Cas en Bas, a scenic ride through the countryside and a stop on the beach for swimming and cantering through the lapping waves.